This Australia Day, SPC is encouraging all Australians to celebrate what makes our country truly great with a slice of pavlova made from products grown right here in our own backyard. SPC has been putting food on the tables of Australians for 100 years - whether its stone fruit like peaches and apricots, tinned tomatoes, or other iconic Aussie snacks such as Tinned Spaghetti or Baked Beans. 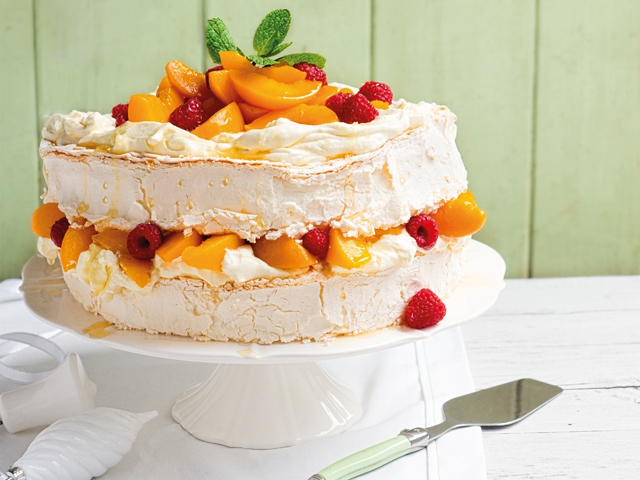 This Australia Day, why not whip up one of nation's most iconic desserts – the humble pavlova but with a delicious Goulburn Valley peach twist? Use an electric mixer to whisk the cream and icing sugar in a medium sized bowl until firm peaks form. Place your pavlova base on your desired serving tray. Spoon your cream onto the top of the pavlova base. Drain the juice from your SPC Peaches. Begin to arrange your raspberries and SPC Peaches on top of the creamed pavlova base. Gently add the second pavlova on top of the base pavlova. Repeat steps 3-5 on second pavlova base. Finish your pavlova with a few mint leaves for garnish.